In the 20th century, however, government got behind the idea that every citizen should be provided a castle of his or her own. Housing, a central priority for government policy for many decades, collapsed in 2008; even in 2011, millions of homes are under water. This poses many economic and ethical issues. 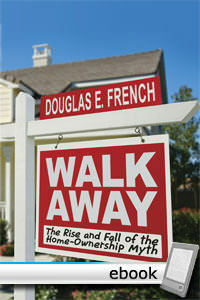 This elegant and fact-filled book by Mises Institute president Doug French examines the background to the case of "strategic default," or walking away from your home, and considers its implications from a variety of different perspectives. The thesis here is that there is nothing ominous or evil about this practice. It is an extension of economic rationality. The collapse of the housing market — which has occurred despite every effort by the government to prevent it — coincides with the highest rate of unemployment among young people that we've seen in many generations. Economic opportunity is dwindling, at least in traditional jobs. The advance of digital technology has made it possible to do non-traditional jobs while living anywhere, and perhaps changing one's location every year or two. This change begins with a single realization: I'm paying more for my house than my house is worth. What precisely is the downside of walking away, of going into a "strategic default"? I lose my house. Good. That's better than losing money on my house. But what about the idea that our home is our castle? Doug French's thesis is that the essence of freedom is to come to understand that the real castle is to be found within.